AYC Commodore Cindy Pillote is the Ruth Beals Cup champ. 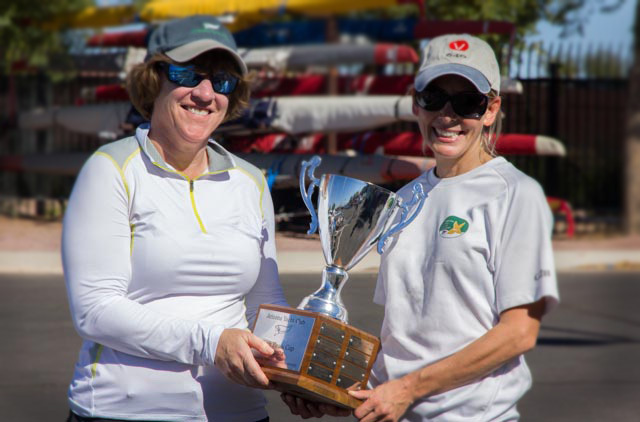 With Chrisann Tortora on crew, Cindy finished the two-race regatta with three points—a win and a second place—to capture the trophy. 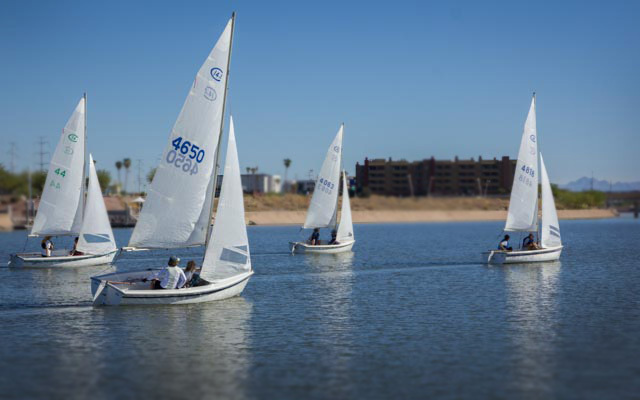 Seven boats competed in the women-at-the-helm races in light air on Tempe Town Lake Saturday (11/9) in the regatta named to honor AYC founder Ruth Beals. Two-time former champ Amy Grothe and father Steve won the first race easily, but then were tripped up by the light air of race two, sliding back to a fourth place finish while Cindy and Chrisann were able to keep their boat moving to win. Third place went to Sheila Reed and Maryellen Ferring. Lori Reger and Andrea Love took fourth by snagging a wisp of a puff in race two and driving past a pack of boats into second place. Ema Davis and Madison Cordova finished fifth overall and two ASU racing team contenders came in sixth and seventh: Kylie Jenkins and Elena Sacco. Mike Ferring, Bob Whyte and George Tingom were race committee. Hoping for a puff. Amy and Steve Grothe. The seven boats of the Ruth Beals Cup regatta head for the windward mark. Making a port start work at the Ruth Beals Cup regatta. 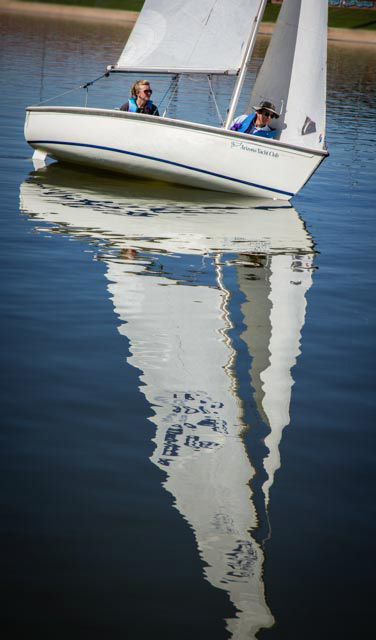 Light wind marked the 2013 edition of the Ruth Beals Cup. Last year, wind was 20+. Go figure.